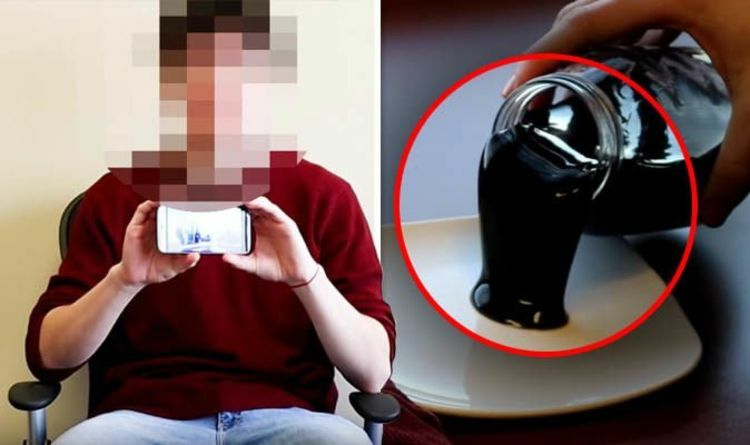 In the video uploaded to YouTube, the alleged time traveller pulls out a glass jar of what appears to be a black jelly-like substance. This “nanotechnology” from the future is supposedly made from millions and billions of microscopic robots. The black jelly appears soft to the touch and not at all malleable, despite Noah’s assurances the substance is used to construct things and heal people. Unfortunately, the time traveller could not demonstrate the blobby substance’s miraculous properties without access to “6G signals” only available in the future. Time traveller Noah said: “Here is technology from the future. “It does not look like anything at first but this liquid-looking substance that looks a little gooey, that is dark, is actually many, tiny robotic molecules all combining together to make a liquid that you can control with 6G internet. The time traveller then threatened to destroy the slimy substance once the cameras stopped rolling, in a bid to stop it from getting into the wrong hands. ApexTV, which filmed the suspicious video, said it was allowed to film the substance only if it followed Noah's strict instructions. Noah said: “You see it looks like a liquid but nothing happens when you touch it. “Look I put my finger in it and I feel absolutely nothing – my finger does not feel wet or anything. However, what the “nanotechnology” does really appear to be, is slime – a liquid-like, substance known for its oozy and squishy properties, typically made from gaur gum. This uncanny resemblance to the popular toy was picked up by a number of YouTube viewers who called out ApexTV and time traveller Noah and claimed the video was a hoax. Andre Gomes Fernandes said: “This video ‘from the future’ is so ridiculous. I think this channel just wants followers."